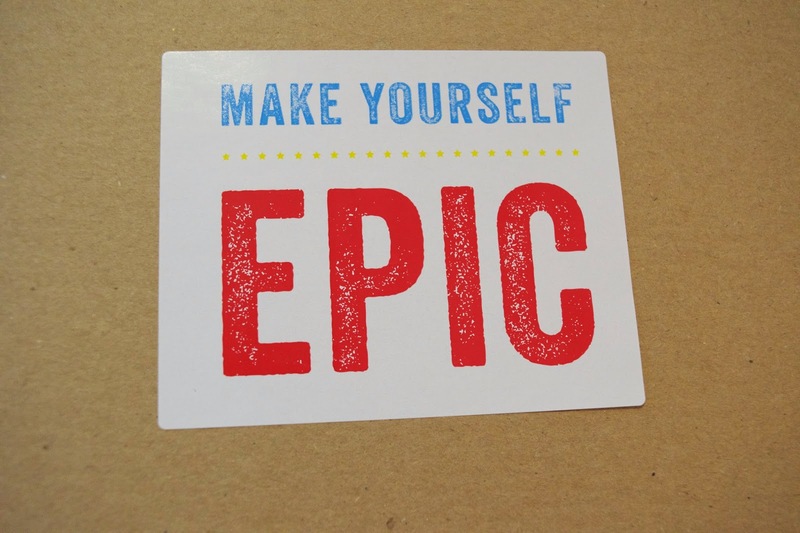 As with previous boxes, on the inside lid of the brown box was a cute little quote saying ‘Make Yourself Epic.’ I really love these little quote stickers – I just think they add something extra to the box and you can also peel them off and use them in your scrapbooking or on an inspiration board. I’ve already peeled this one off and have stuck it in my daily scrapbook! 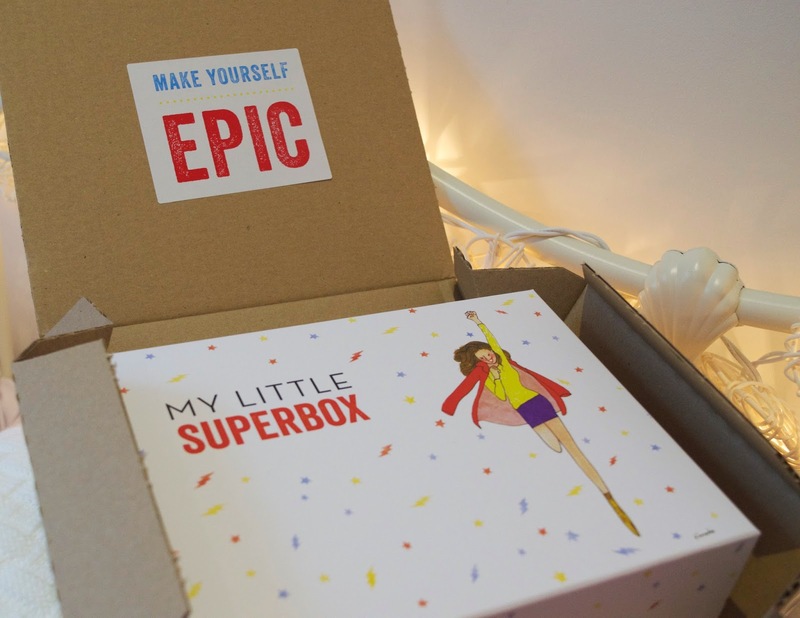 The March Box is labelled the Super Box, which I was quite excited about as I thought a superhero theme was such a fun idea. As always, it was displayed beautifully and tied together with a bow. 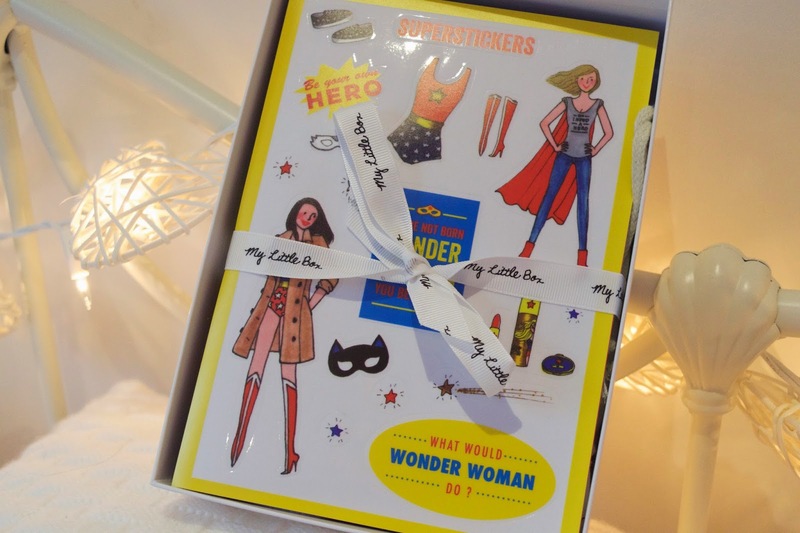 The first thing I found when I undid the ribbon was not the A5 print like normal, but a sheet of superhero stickers instead. I’m definitely grateful for a sheet of cute stickers as I do a lot of letter writing to penpals and always use stickers to decorate my paper, so these will come in very handy. However, I’m a bit disappointed that I didn’t get an A5 print this time, as I thought they were such a lovely idea. I’m not sure if they just forgot to put one in my box, or whether none of these boxes have one this month, but I really hope they’re not going to stop putting them in altogether! 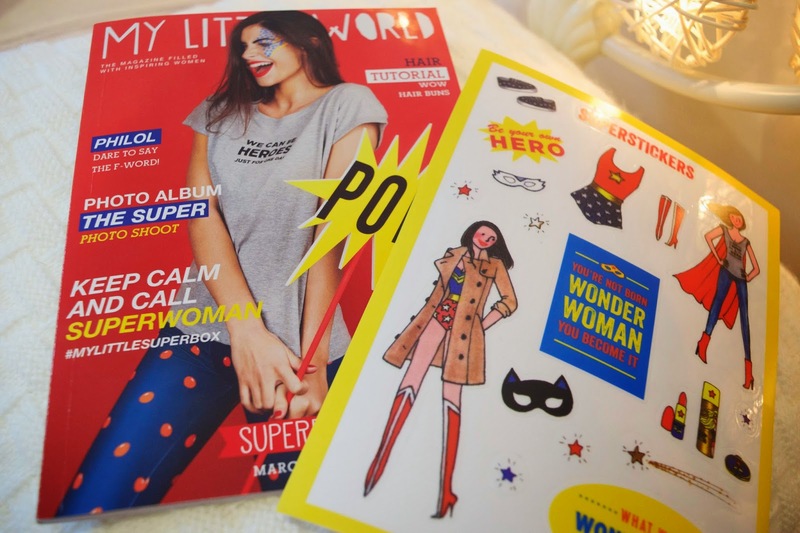 In this months box I also received the ‘My Little World’ A5 magazine, which I’m really looking forward to flicking through. From what I’ve seen so far, it seems to have a whole range of articles to read. 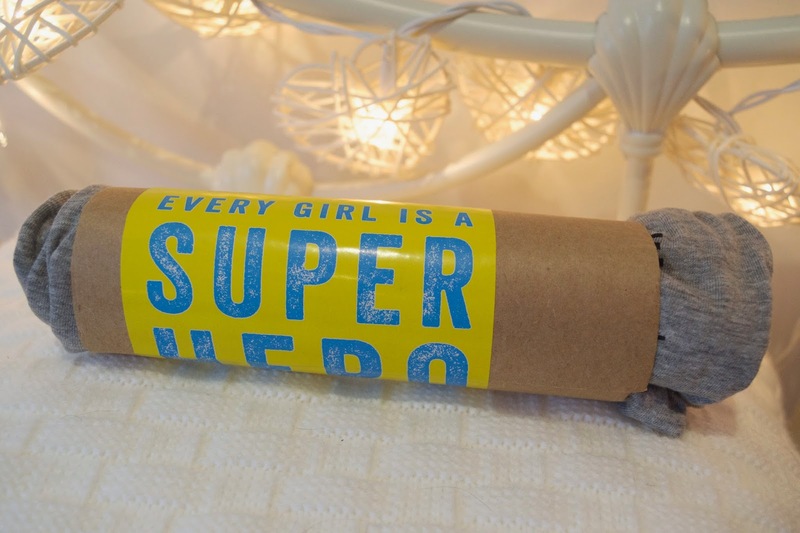 Underneath the stickers and magazine was rolled up piece of grey material, with a cardboard tube round it and the words ‘Every Girl Is A Superhero’ on the side. 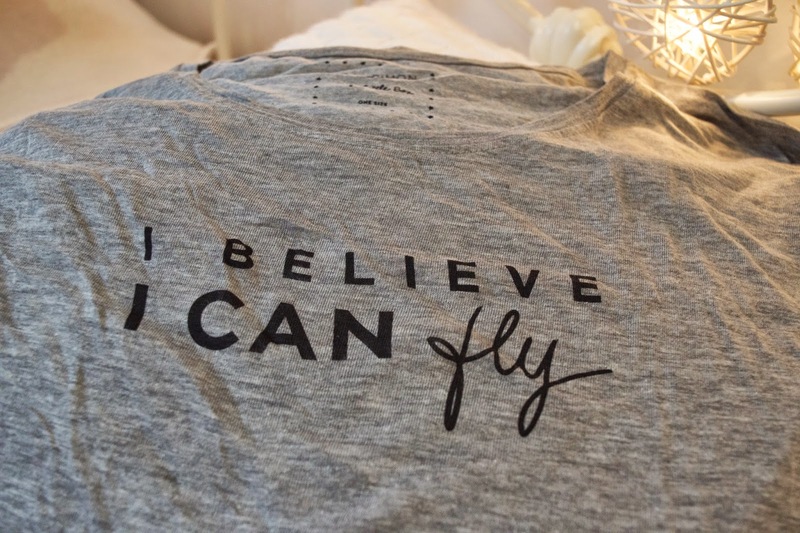 I wondered what on earth this could be when I first saw it, but after unravelling it I discovered it was a t-shirt with the phrase ‘I believe I can fly’ across the front. I’m a little concerned it’s not going to fit me as it’s quite small, but I’m hoping it will as it’s a really cute t-shirt and will be great for the summer. 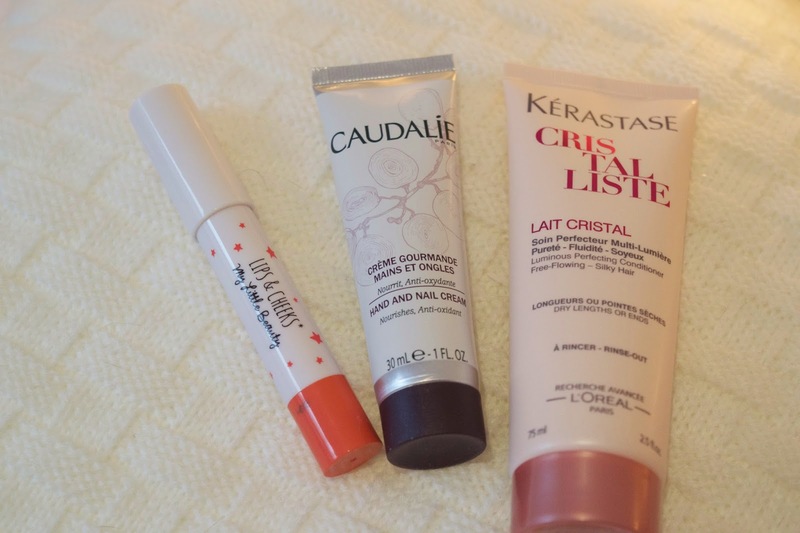 The final thing I found in My Little Box this month were the cosmetics. They came, like last month, in a cute little cotton bag, which is always such great quality. I just wish I knew what to do with all these bags I’m accumulating! The first thing I picked up was the Kerastase conditioner. It’s not a brand I’ve ever used before but I’m really looking forward to giving it a try, as I’ve heard good things about the brand as a whole and I always love trying out new hair products. Next up was this Caudalie hand and nail cream, which I’m so excited to try. I’ve heard a lot of bloggers raving about Caudalie and I’m a big fan of hand creams, so the combination should be perfect for me! Then came the ‘My Little Beauty’ offering, which, this month was a lip and cheek pencil in a sort of orange-y pink colour. I’ve given it a quick try and it seems to have a really nice creamy consistency, so hopefully it will look nice on my face in the up-coming warmer months. So, that’s everything that came in My Little Super Box this month. I really loved the theme of this month’s box and I think the cosmetics are some of the best yet. I’m really hoping the t-shirt will fit me though and I am disappointed that there wasn’t an A5 print this time, but overall I really liked it. As always, I’m already looking forward to next month’s box arriving! What a cute box! I've seen the previous boxes and they're so adorable, it makes me want to subscribe! I think the t-shirt is a nice added touch, but they probably should have done a personalised survey to make sure everyone got the right sized shirt for their body. I love the stickers too. They're too cute so I wouldn't want to use them! This looks like such a cool box, love the range of stuff you get!